He also cleared up, at least in my mind, the controversy over how many nights the events took place. I had asked both John Burroughs and Jim Penniston about that, and they disagreed. One said it was three night and the other said it was two. Given what Halt said, they were both right. The first night involved a number of enlisted personnel who had seen something in the woods outside the base perimeter and went to investigate. The second night only involved two people, a second lieutenant and an NCO. They were the only two who saw anything on that night. On the third night, Halt, leading a small party went out as more lights were seen in the forest. He provides some of his observations that night. He talked about some of the physical evidence that was recovered, some of the observations by instrumentality, which is to say radar confirmations that he learned of years after the event, and the enhanced debriefings that were undergone by the enlisted personnel. He was not debriefed on the sightings. Topic: UFO investigations in Texas and Mexico. I've been monitoring the blog for some time with great interest and this incident finally has gotten me to chime in. I find this incident extremely compelling. Particularly the experience in the farmer's field with the multiple objects flying overhead and the collimated light shining down at their feet. Not to mention that there were multiple witnesses in the field along with Halt. I find this hard to refute. It doesn't prove alien activity but WOW, for me, this is as close as I've seen. I just cannot see how the activities experienced in that field were anything other than described. There will be others who will have an answer, I'm sure. My only question is - why wasn't Halt interrogated in the same manner (chemically, ect) as the others? This is assuming others were interrogated as Halt suggests. Halt is a professional and will not talk about nuclear weapons which were stored there in the nuclear wapons storage area. The "beams" from the UFO landed upon the NWSA and one of the devices were supposedly removed. 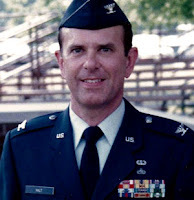 I believe Col. Halt did not find out about "chemicals" being used on some airmen until later, and this, he claims was done by outsiders who came onto the base for that purpose. ( The goal here may have been to erase and/or distort memories.) My opinion on Nukes is that we need to get rid of all of them. We do not need them as we have other options. Halt is one of those highly credible witnesses who is impossible to refute (except through character assassination plus use of drugs). A high level command officer, highly credible, and an eyewitness to incredible things that are impossible to explain away in a conventional way. Skeptics, if you don't want your head taken off, don't tell Halt to his face all he and his men saw was a lighthouse, re-entering space debris, and rabbit holes. Also very interesting is Halt standing his ground on there being a coverup by the UK and US, including working some of his men over with mind-altering drugs. Although pricey, I plan to get his 800 page book. I think this is one of the best cases we have. I don't understand how some people can buy the lighthouse story, it makes no sense. Why would the lighthouse cause a commotion on only three nights? These Security Police, for the most part were not new to the base and were surely aware of the lighthouse. Halt certainly was, he said he had a friend who lived near it. How does it explain the beam of light that Halt and others reported? On the second night a young officer is said to have had a nervous breakdown from what she saw, a lighthouse can cause a nervous breakdown? Seems quite a stretch to me. If this was such an insignificant event as some claim them why did spooks get involved in the debriefings? I guess they had nothing better to do than to intimidate young Airmen, and drug them. Colonel Halt's and John Hanson's book THE HALT PERSPECTIVE contains more photos - and the vast majority in color - than most any other book on UFOlogy. It is well worth procuring. I see Larry Warren is copping for the usual flack dished out by Halt. Now I don't know if Warren was an eye witness to any of the events or not, but one thing is certain and that is we should be grateful to the guy for having the guts to have got the story out in such a short time as opposed to the 30 year lag that has hampered the Roswell investigators so badly. This good fortune is 100% down to Warren...0% to Halt. Halt, instead of slagging the guy of at every opportunity, should be thankful for the secondary career he gained off his bat as an author, convention speaker and general "D list" celebrity. I've heard Halt say that Warren's head has been messed with. I presume he was referring to the chemical "debrief" that other players went through. The question would be...Why would Warren have been interrogated if he hadn't been there? If it had been left to Halt, we would know NOTHING about the Rendlesham incident. I disagree with your assessment here. Warren has complicated the story, embellished his role, changed his tune a number of times and said things that are simply not true. While Warren did mention this to Barry Greenwood and Larry Fawcett, it does not necessarily follow that the story wouldn't have been told without him. Some of those involved were still in the military at the time and it could have destroyed their careers and I'm not only thinking of Halt here. But it answer your question... We don't know that Warren was interrogated... although he was assigned to the base and the security flight at the time and that in and of itself might answer the question. Very interesting interview. Halt sounds like a solid guy. IIRC, He has never changed his story. The part about the interviews by "outsiders" reminded me of something I read years ago, about the Apollo astronauts being given drugs during their debriefings. I can't see the justification for this in any circumstance. Maybe for terrorist interrogations, but US military in good standing? When 'outsiders' (like CIA) are allowed to interview military personnel, I'd assume the orders would have to come from fairly high up in the command chain. Were the outsiders military? I don't recall. In any case, orders would have been needed. If you take it back to the original documentation and the Halt tape, together with the early descriptions of the case by the principal witnesses then you have what must have been truly puzzling set of observations. I do think the main sceptical interpretation of the case is quite plausible (see for example Ian Ridpath's website for a good presentation of that point of view). On the other hand I was extremely disappointed by the way this has been treated by some of the pro-UFO authors. Nick Pope's book on the subject is a good read but splits up the elements of the most likely sceptical scenario so the reader does not get a sense of the way they fit together, but rather forms an initial view that they are separate proposals which don't fully explain the case, mixed in with a number of truly silly claims. The re-entry of the Soviet satellite earlier that evening with a plausible angle of view to set off chatter amongst the guards of something coming down into the woods should really be a wake up call as to how this thing probably started. I also hadn't realised until I did some fact checking of my own just how thin the woods were at the relevant point, making it far more credible that light from the lighthouse could be seen in the woods. The description of the light receding through the trees as they advanced is typical of a distant light source. Judging the distance to a distant light at night is notoriously difficult. They were looking for something in the woods and not many of us would think of a lighthouse beam in that scenario. There does seem to be a possible line of sight to the lighthouse, although I doubt it is possible to be 100% certain of the exact position of the men to confirm or falsify that possibility. Exactly how a lighthouse beam would look through night vision equipment of that period I have no idea - peculiar I would suspect but that would need expert opinion. The presence of the clearing, holes and minor transient spikes in radioactivity do not strike me as odd at all. The subsequent escalation in claims is worrying, with claims of a close encounter, telepathic communication and a message, along with beams of light and all that sort of stuff. This rather hollows out the range of possibilities into a real technological event or something which started as a genuine misidentification but has turned into something less acceptable. At the moment I think this was almost certainly a misidentification which has rather got out of hand over time. As always very open to any evidence I may have missed - it would actually be very nice indeed to put my worries about this case to rest but it would take something quite convincing to do that at this stage. Albuquerque Girl Burned by UFO?